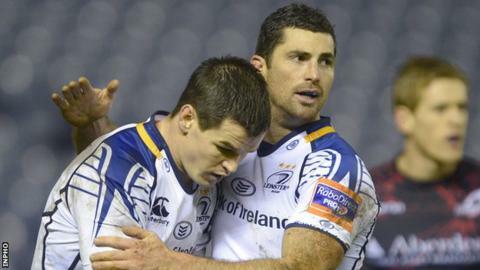 Rob Kearney has delivered a boost to Irish rugby by signing a new two-year contract with Leinster. The Ireland full-back had been negotiating with the Irish RFU for some time and there were fears that he might join Jonathan Sexton in opting to make a big money move to a French club. However, Kearney confirmed his new two-year Leinster deal on Tuesday. "There is no place like home. Delighted to have re-signed with Leinster for two more years," said Kearney on Twitter. "Great club, players coaches and supporters." The Irish RFU revealed two weeks ago that Sexton would be moving after this season to a French club that is believed to be Racing Metro. Kearney, whose current deal was until the end of this season, said last week that he had discussed the issue with his Leinster team-mate Sexton and acknowledged that other Irish players could follow the Ireland fly-half to France. The full-back's comments did lead to fears of a possible exodus of Irish talent but Tuesday's news will be a major relief both to Leinster and the IRFU. Kearney was named ERC European Player of the Year last season and his current form is likely to make a certainty for Warren Gatland's Lions squad in the summer.